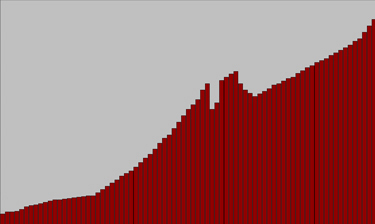 Peak Oil Why This Film? Data Links Solutions? What Is "Peak Oil" All About? Peak Oil is a catch phrase used to describe the moment when oil production stops increasing and begins to decline, that is, when production reaches its all-time peak. There are various concepts underlying this and the charts found on the "Data" page illustrate this. The two graphics, below, illustrate the concept. Oil production has been steadily increasing since the very early days of oil exploration and production. The chart goes from about 1930 until 2005. Because there is a finite amount of oil on the Earth, there will come a point where production can no longer increase. At that time, there is still a lot of oil in the ground. However, with rising demand from China and India and ongoing strong demand from Europe and the United States, a serious price war will break out at that point. That is the point known as the peak. Production begins to decline and everything starts to change. Some experts believe we are already just past that point. Oil production increases for many reasons, but the primary reason is the discovery of more places on the planet to drill that end up producing oil. Oil exploration has grown increasing sophistocated and powerful, with computer technology now capable of imaging the underground rock formations in 3D detail. 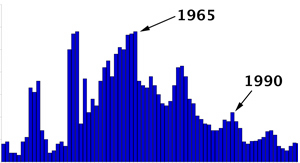 Nevertheless, the rate of discovery has been trending downward ever since 1965. It appears that the easy-to-find and easy-to-produce oil has already been found. The oil discoveries of each year are meager in comparison to production. It's a fact of geology, that big oil fields are easier to find than little ones. It appears that we've found all the big ones.